The number of old people in the UK killing themselves has fallen. Why? Once elderly people in the UK were the most likely group to take their own lives, but now they are at lower risk than the middle-aged. Why? When a person takes their own life, the effects on families and friends are catastrophic. The latest figures from the UK's Office for National Statistics (ONS) show middle-aged men are the most likely group to do so, the suicide rate among them having risen to its highest level since the early 1980s. But something mentioned less often is that, over a longer period, the number of elderly people in the UK killing themselves has fallen massively. In the early 1930s, the height of the Great Depression, as many as 50 per 100,000 men over the age of 65 took their lives every year in England and Wales. After a slump during World War Two, the figure was back up to above 40 in the late 1950s, making the elderly the most at-risk group. But the suicide rate declined sharply during the 1960s and early 1970s. It plateaued into the 1980s and then fell again from the end of that decade. The latest ONS figures, for the whole UK in 2013, show the suicide rate among men aged 60 to 74 was 14.5 per 100,000 and 15.4 for those aged 75 and over. For women of the same ages, the figures are 3.9 and 4.7 per 100,000, roughly a quarter of the rates of the late 1950s and mid-1960s. For both sexes the elderly are now the least likely to kill themselves, apart from 15 to 29-year-olds. This change is not the case around the world. "With regard to age, suicide rates are highest in persons aged 70 years or over for both men and women in almost all regions of the world," the World Health Organization (WHO), which published its first report on suicide prevention last year, says. So, what has driven the fall in elderly suicides in the UK? A study, published in 2003, suggested it could be at least partly due to national economic growth, with the elderly less susceptible to problems caused by fluctuating levels of unemployment, and better healthcare, which has been universal since the NHS was founded in 1948. Another factor discussed was the increased prescription of antidepressants, to deal with clinical depression, sufferers of which have a higher rate of suicide. Also, whereas pensioners might once have been expected to be poorer as a group, "greater age equality in social and economic circumstances" was a possible suggestion. Yet the researchers, from Leeds and Bristol universities, said there was "no single factor" that explained the fall in suicide rates. "Over the last 50 years or so, attitudes have changed," says anthropologist William Pickering, who set up a centre at Oxford University to study the works of Emile Durkheim, the French sociologist who wrote a seminal work on suicide rates and causes in the 1890s. "We are much more concerned with older people, and therefore people are not made so lonely," adds Pickering, who is 93. He says better medical care and social services and clubs aimed at keeping people involved in society have helped. "I sometimes think of how my father was when he was ill about 40 years ago and how isolated he was then and how much better it is now compared with then. In some societies, in contrast, the elderly are seen as useless and become marginalised." It has also been argued in recent years, notably by former education minister David Willetts, that the "baby-boom generation", born between 1945 and 1965, has grown up amid the security of the welfare state. It has had a far better deal than young people today are getting, in terms of being able to buy a home and getting a good pension, Willetts wrote. This, it might be argued, contributes to greater happiness among the elderly than was once the case, but it still fails to address the causes of the long-term decline in suicide, a complex area involving cultural, economic, psychological and other factors. Consultant psychologist Ajit Shah, of the University of Central Lancashire, complains of a "paucity of studies" of age-related suicide trends. Roger Webb, reader in mental health epidemiology at Manchester University, feels there may be a "publication bias", likening the attitude among academic journals to that of newspapers. "Academics want to get stuff published," he says. "It's easier to get a bad news story published than a good news one." This may have militated against more study of the decline in suicide among the UK's elderly, he argues. Other academics contacted by the BBC agreed there had to be more investigation of this and how it might relate to prevention and reduction more generally. "There might be something that's transferable," says Webb. But many in the UK would vehemently disagree that life is getting better for the elderly. A survey this week of more than 1,000 over-60s suggests more than three-quarters want a minister for the elderly appointed to deal with concerns including healthcare, loneliness and isolation. 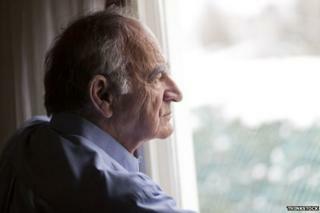 It's predicted that the number of older men living alone in England will increase by 65% by 2030. There is a more intense debate taking place in countries where suicide among the elderly is not declining. South Korea, according to the WHO's figures, had a suicide rate among men aged 70 and above of 192.1 per 100,000 in 2012. The rate has more than trebled since 2000. Commentators have blamed a weakening of family ties, resulting from urbanisation and a greater focus on young people succeeding. Older people have become poorer and more isolated as a result, it's argued. In 2013, the South Korean government helped train 8,000 carers to look for signs of potential suicide in the elderly. In the US, 65 to 84-year-olds are slightly more likely to take their own lives than 25 to 44-year-olds. The second highest rate of all is among those aged over 85. "An obstacle faced by mental health professionals and other caregivers in reaching this group," says the American Association for Marriage and Family Therapy, "is that older adults do not usually seek treatment for mental health problems. As such, family and friends can play an important role in prevention." Around the world, more than 800,000 people a year kill themselves, with many more attempting to do so, according to the WHO. "No matter where a country currently stands in suicide prevention," said Alexandra Fleischmann, a scientist in the organisation's department of mental health and substance abuse, "effective measures can be taken, even just starting at local level and on a small scale." Christchurch in Dorset has one of the largest populations of older people in the UK. The Office for National Statistics divides England and Wales into over 35,000 areas averaging about 1,600 people - and two of the top 10 areas with the most elderly populations are in Christchurch. The median age in the most elderly part of the south coast town is a rather remarkable 69.8 years old, with only a pocket of Eastbourne having an older median age of 71.1 years. Away from these extremes, there are figures for wider council areas showing that Christchurch has a higher proportion of residents over the age of 65 than anywhere else in the UK, with almost 31%. How you can seek help: Rethink Mental Illness has more than 200 mental health services and 150 support groups across England. Its number is 0300 5000 927. Samaritans provides 24-hour emotional support for people who are experiencing feelings of distress or thoughts of suicide. Its number is 08457 90 90 90.